Booming Games has done it again, they’ve developed an online video slot that’s fun to spin and that brings to the table some nifty bonus features. There are 5 main reels and an extra bonus one, 3 rows and 10 fixed paylines to discover. The bet level ranges between €0.10 and €500, making this suitable for both players who like to spin at low bet levels and for high-rollers. The Bonus Reel is filled with only bonus symbols. Multipliers of 5x, Free Spins triggering symbols and interacting symbols are 3 of the things that can land on it. To reveal any of the treasures hidden deep into the monkey world, land 3 matching symbols consecutively on an active payline. Like in all video slots, the Wild substitutes for all other symbols, with the only exception here being the Scatter and the Interacting symbols. The Scatter does not have a payout, but 2 instances of it will trigger 5 Free Spins. During this bonus feature, all wins are multiplied by 5. The Golden Monkey is the Interacting Symbol. If 2 land side by side, anywhere on the reels, a special win will be awarded. It is during this feature that you can win 50x your bet so be on the lookout for the Golden Monkey. 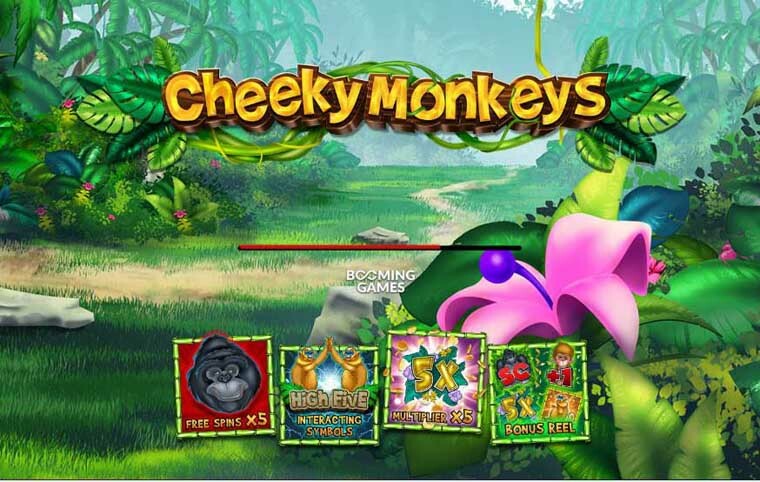 Why play it: Cheeky Monkey is just the slot to play if you’re feeling in the mood for dynamic spinning, lively bonus features and unique prizes. The fact that there’s always a 5x multiplier to be won and that last Bonus Reel, just made it all the more fun for us.